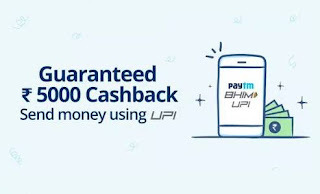 Paytm – Get upto Rs 5000 Cashback on UPI Transactions via @Paytm UPi Handle (5000 Times), Paytm UPI Offer. Paytm has come up with an awesome deal, Now Get Flat Rs 1 Cashback on Every transaction via @Paytm UPI Handle. Maximum cashback is Rs 5000 per user. So Hurry up and avail this Offer now !! 8) You will get the Rs 1 Cashback on Every Transaction within 48 hours. You can avail upto Rs 5000 Cashback. No Source, But banner available in Paytm app homepage >> 2 inches scroll down >> Slide the banner’s and check the 2nd Last one ! !, validity is until banner is visible. 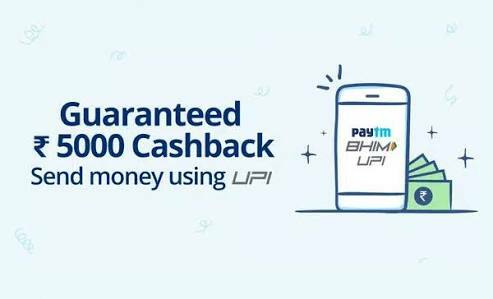 1) Get Rs 1 cash back on every transaction at Paytm if you pay using paytm UPI address. 4) Minimum transaction size has to be Rs 10 You can get cash back up to 5000 times.